Pixel Art makes us smile, it provides a unique view on the world and is often used to produce pixel based towns. In general Pixel Art can be defined as anything drawn in the medium of computer pixels – these are usually created one pixel at a time at small scale to reduce the time taken to create the images. The beauty of Pixel Art is the clean and unique image they can create, especially when moving to the isometric viewpoint. One such example is the Pixel Tower, pictured left, which demonstrates the type of image that Pixel Art creates. Creating Pixel Art seems to be a slow process, mainly in MS Paint, drawing pixel by pixel. 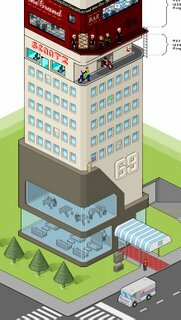 To understand the concept there is a great tutorial on Isometric Pixel Art by PixelFreak. While we like Pixel Art we are not sure we have the patience to create it, especially as the majority of our work is 3D in the first place. To take a short cut, which we know will be frowned upon in the Pixel Art world, we have used SketchUp to recreate similar views. This post is out first take on the technique using the Euston Tower in London as a test. 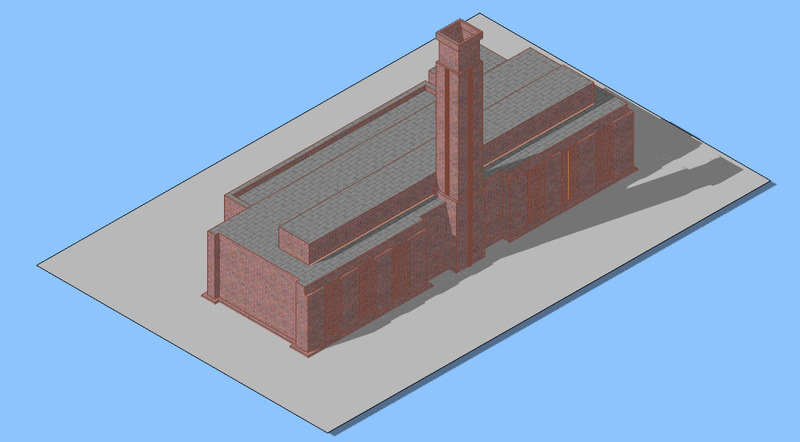 1) Create your model as normal in SketchUp, or download one from the SketchUp 3D Warehouse. 2) Set your camera view to ‘ISO’ – Isometric, this gives you the angle at which Isometric Pixel Art is created. 3) Select ‘Camera’ from the menu list and unclick ‘Perspective’, your view should now be similar to our Euston Tower or simple Tate Modern example as pictured below. 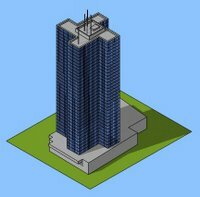 Using this technique you will be able to rapidly create a Pixel Art town which can of course still be viewed in 3D should you so wish. Feel free to send us any images or SketchUp files, it would be interesting to create a SketchUp Pixel Art town.. If anyone else sees this and reads please do try to make pixelart that’s real. It takes more time but quality trumps speed. We are hard working art nerds fighting a losing cause and acknowledge as much. Visit places like pixeljoint.com for the beauty of pixels. We are an endangered species support us by not doing this with SketchUp. hey this is great, I was looking for something similar. I myself am not a digital artist person, I prefer drawing by hand on paper and stuff, but I do use the isometric perspective lately, to get a really global view of everything, and am really interested in isometric pixel art. This is a travesty to true isometric pixel art. If you find the quality result not worth your time, buzz off and do something else. We agree – we love Pixel Art – really we do, the tutorial was merely a pointer to interesting new techniques. It was not meant to offend, only to raise awareness of new visualisation techniques. This can be used as a tool to understanding shadows etc. I think it’s great. Though it will never ever replace pixel pushing. It’s childish to tell people to “buzz off” because it isn’t “true” PixelArt. The issues in the comments (and my issue with the main post) is grouping ‘isometric art’ and ‘pixel art’ into one lump category. The method describes in the original post is for making ‘isometric art’ and NOT ‘isometric pixel art’. Yes, a lot of pixel art was/is isometric, but not all. And, certainly, making something isometric does not make it pixel art. Hopefully that clears up some misunderstanding for anyone still reading this post. 4) You can add a nice pixel-art style to your standard isometric 3D models by saving a jpeg of your 3D model (try screen-grab) and using Photoshop to apply a “Mosaic” effect from the Artistic Filter toolset. Adjust the the pixel size value to your desired pixel size. I think it’s useful as a tool to help making isometric views, but not using them as a finished product. I am a one-pixel at a time guy. I have found Sketchup is very useful as a starting point for building referance models, but to try to make a “finished” pixel art piece with SketchUp is out of the question for me. Sure, there are many short cuts one can take, but art is about more than the finished result; it is also about process. If you want to make a pixel art simulation, then do what you have to do. I you want to make pixel art, then gather your reference material (3D models, photos, sketches, etc.) and get to work pushing pixels. Am I to take it you can’t use lines or other shapes -which even MS Paint have- if you’re creating ‘real’ pixel art. So if you cheat and use the line command, you’re a sell-out, though no one can see you and they wouldn’t know. For anyone coming late to this post… It’s not actually at the exact angle that you make pixel art art, so you can’t just take a screenshot then draw over it with pixels. 1: draw a triangle along the red or green axis(with with and therefore surfaces) with the proportions of height: 8.55, base: 5, width: any value. 2:rotate it 45 degrees. 4: in the camera menu, switch “parallell projection” on. As for pixel art, it’s great to draw the rudimentary shapes in SketchUp and then cover the 2d-exported image with a layer of your own pixel pushing.